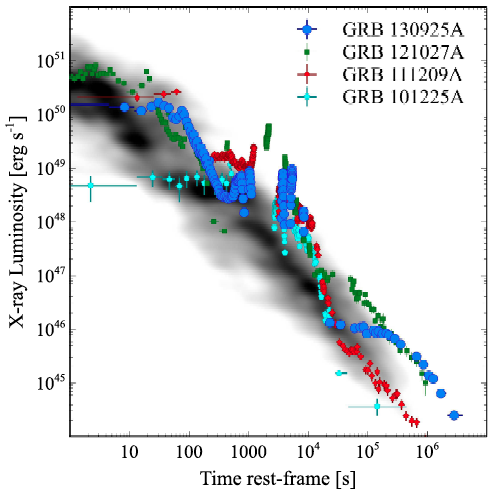 Figure 1: X-ray light curves of ultra-long GRBs (colored points) such as GRB 130925A (in blue) as compared to “normal” long GRBs (greyscale). Ultra-long GRBs remain initially bright for much longer (note the logarithmic scale of the x-axis). Source: figure 1 from Piro et al. Gamma-ray bursts (GRBs) are some of the most powerful phenomena in the universe: about 1016 times more luminous than the Sun, on average. These egregiously energetic explosions are divided into two broad categories based on how long they last: “long” GRBs (more than a couple seconds) are thought to be produced in the death throes of a very massive star, while “short” GRBs (< 2 seconds) might be generated when two compact neutron stars merge (see these astrobites for more on GRBs). There is some debate over whether there could be a third category of “ultra-long” GRBs lasting longer than a couple of hours — a thousand times longer than the “long” class — that comes from an entirely different sort of progenitor (see Figure 1). Today’s astrobite discusses a paper that provides evidence that low-metallicity blue supergiants — massive stars with gigantic, puffy gaseous outer layers — may be the progenitors of ultra-long GRBs. The very first stars in the universe are theorized to end their lives as blue supergiants, and so understanding this class of GRBs may provide a unique window to our cosmic dawn. GRBs are first detected by satellite-borne instruments such as the Swift Burst Alert Telescope and FERMI Gamma-ray Burst Monitor that continuously monitor large portions of the sky for high-energy gamma ray emission. On September 25, 2013, Swift detected an unusually long-lasting GRB, which was dubbed 130925A (GRBs are named after the day they are discovered). Although in most cases the initial burst of gamma ray emission is often quite short — generally only a few seconds (exception: ultra-long GRBs like 130925A! ), there is also additional x-ray, optical, infrared, and radio emission caused by interaction of the material ejected in the GRB with its environment called an “afterglow” that persists for hours to days. Soon after it was first detected, telescopes covering the electromagnetic spectrum turned their eyes on the GRB’s position. The first follow-up observations (from the X-ray telescope, another instrument on Swift) began only two and a half minutes after initial detection. Later, optical telescopes both on the ground (the European 2.2 meter at La Silla, Chile) and in space (Hubble) revealed that the afterglow showed signs of high extinction by dust in the burst environment, suggesting that the explosion took place in a dense, dusty medium. Radio observations taken using the Australian Telescope Compact Array followed in October 2013 and January 2014, probing the synchrotron emission caused by electrons being accelerated in magnetic fields. The radio emission remained constant over this time period. Long GRBs are thought to occur when a very massive star called a Wolf-Rayet star expends its nuclear fuel at the end of its lifetime and begins to collapse. These aren’t just your garden-variety massive star, though; a Wolf-Rayet star is the end stage of evolution of a star that was luminous enough that radiation pressure was strong enough to unbind its outer gaseous layers and push them into space. Thus Wolf-Rayets are surrounded by shells of their own expelled dust and gas, and are also quite a bit smaller (in both mass and radius) than they were at birth. In the widely accepted “collapsar” model of GRBs, the duration of the burst is related to how long it takes for the star to fully collapse into a black hole and accompanying accretion disk, as the energy for the burst comes from mass falling onto this so-called “central engine”. Since a Wolf-Rayet star is relatively small compared to, say, a supergiant star that has held onto its outer layers, it will collapse in a much shorter time (perhaps in just seconds to minutes) than the supergiant would, and so produce a shorter duration GRB. In fact, a blue supergiant star could supply mass during its collapse to fuel a GRB for up to hours — similar to the measured durations of ultra-long GRBs. But what sets the mass loss rates of stars? One major component is the star’s metallicity, or concentration of elements heavier than hydrogen and helium. 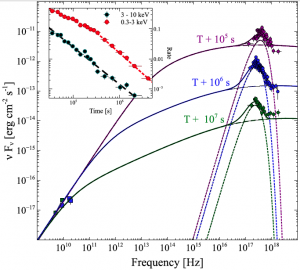 Metal atoms have many more potential atomic transitions than lighter ones since they have more electrons, and thus they can absorb photons of a variety of energies more readily. This means that in lower metallicity stars radiation pressure is less effective at removing outer layers. Figure 2: Model fits (lines) to radio and x-ray data on the afterglow of GRB 130925A. The model parameters are consistent with a low mass loss rate progenitor star like a blue supergiant. Source: figure 2 from Piro et al. The authors find two primary lines of evidence that support the idea that the progenitor for GRB 130925A was a blue supergiant: a long duration burst, and a low mass loss rate. First, they suggest that since this burst lasted for hours, the progenitor star must have had a large radius, as discussed above. 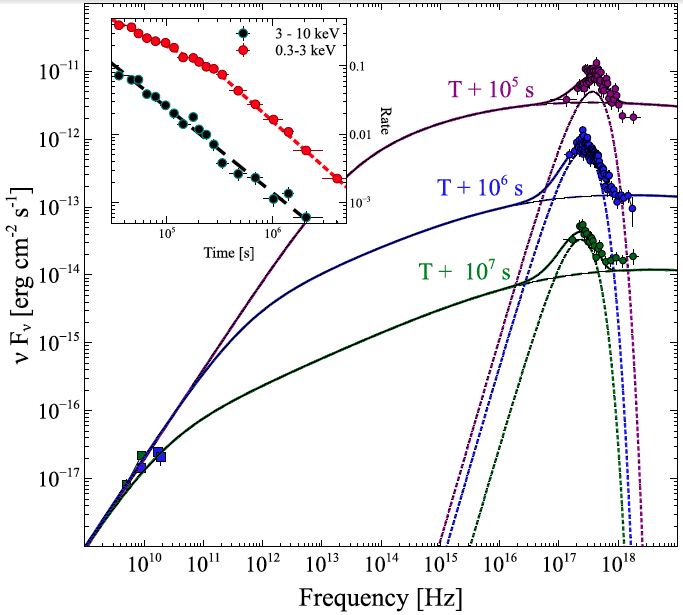 Second, they model the x-ray afterglow spectrum as a shock wave expanding into an environment into which the radiation-driven stellar wind has been flowing for some time. The model that best fits the data is a star with a large radius and relatively low rate of mass loss — consistent with a blue supergiant progenitor, not a Wolf-Rayet. GRB 130925A is one of only four ultra-long bursts discovered to date, marking these as extremely rare events in the local universe. One explanation may be that low-metallicity blue supergiants, the progenitor argued by these authors, are correspondingly rare. Since each generation of stars enriches its environment with successively more metal-rich material, there are fewer and fewer low metallicity environments left in the universe approaching the present day. Intriguingly, theorists predict that the very first stars to form in the universe ended their lives as blue supergiants, and so it may be that these rare events are giving us a glimpse into something we probably won’t ever see directly: the deaths of the first stars.